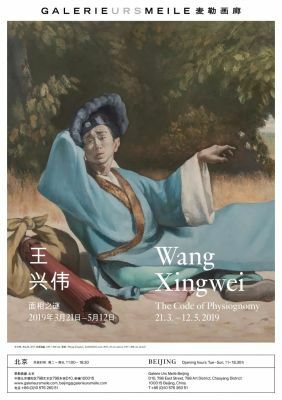 Galerie Urs Meile is honored to announce the opening of The Code of Physiognomy, the solo exhibition by Wang Xingwei (*1969, Shenyang, China) at our gallery space in 798. The exhibition will present the main body of works Wang has painted since his last solo exhibition in 2016. While the principal of plastic art has always been the artist’s emphasis, this new body of works turns its focus to the characteristic and detailed shaping of images and figures. Various portraitures that are loaded with referential symbols and playful metaphors will be presented, which allude to the title of the exhibition. Two significant pieces titled Noon Break (2017–2019, oil on canvas, 4x 200 x 240 cm) and Four Seasons (2016/2017, oil on canvas, 4x 240 x 200 cm), each consisting of four big-scale single panels, will be also included in the show. At the same time, we are pleased to announce the opening of Shenyang Night, another solo exhibition by Wang Xingwei in our former gallery space in Caochangdi, which now hosts our artist-in-residence program. The exhibition will take place concurrently with the Gallery Weekend Beijing 2019 (March 21–31). The eponymous work, Shenyang Night (2018, oil on canvas, 300 x 500 cm), forms the centerpiece of the show. The common theme of all the other works in the exhibition is the commemoration of the artist’s youth and the works completed between 1990 and 1993 in Shenyang. The bitter sweetness of youthful years, the reminiscence of a glorious past, the incurable romanticism and idealism are embodied in these works. Wang Xingwei's creations has always been cleverly arranged together with seemingly unrelated elements, and his imagination often gives the picture a witty taste. He extensively appropriates the elements of art history to provocatively "adapt" Chinese and Western art history and classic paintings, and presents his own vivid and powerful visual expression through the appropriation and splicing of images, the citation and transposition of texts. The viewers are pleasantly surprised by the witty narratives and the collective symbols of the times evoked by the artist. The form of the "dual exhibition" aims to sort out and present the artist's creative trajectory and the direction his deepening and expanding practices.